This is a very unpretentious and amiable wine country winery set amongst the foothills of Monmouth, Oregon, twenty miles northwest of Corvallis at the coastal edge of the southern Willamette Valley. The indoor and outdoor modest tasting room is rustic, casual and quintessential Oregon in character, patrolled by two friendly dogs eager to greet arrivals. The hosts when I visited, Mary Olson the owner (pictured below), and Kim Swicker, were easygoing and personable, much like the praiseworthy wines Airlie produces. The estate vineyard, now consisting of 30 acres and named Dunn Forest Vineyard, was originally planted by the previous owners beginning in 1983. They founded Airlie Winery, named after the town name of Airlie that dated to the early 1800s. Mary Olson, who had little experience in wine, but had a passionate interest in it, bought the estate vineyard and winery in 1997. She had worked as a general manager for Northwestern Bell for two years in Oregon and was determined to buy a winery in Oregon. She has since transformed the property into a first class vineyard and winery. Dunn Forest Vineyard is planted to eight grape varieties and varietal wines are made from each. Airlie also is the exclusive recipient of grapes form the 12-acre BeckenRidge Vineyard in nearby Dallas owned by Denny and Kathy Needham. 65% of the grapes used in Airlie vines come from Dunn Forest vineyard and 45% from BeckenRidge Vineyard. The vineyards are certified sustainable by L.I.V.E. and certified Salmon Safe. Winemaker Elizabeth Clark’s odyssey turned out to be fortuitous for Mary. Elizabeth was a math major with a minor in Russian at Goucher College in Maryland. In 1999, she hitched a ride to Oregon with a friend, knowing that her cousin was living in Portland. She had little interest in wine but spent the summer exploring Oregon. Her interest in wine and its affinity with food blossomed while working for a caterer in McMinnville, leading her to land a job at Amity Vineyards in Amity, Oregon, where she stayed for five years and rose to the position of assistant winemaker. 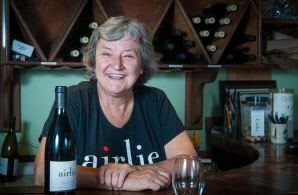 While at Amity Vineyards, Elizabeth attended a wedding at Airlie Winery, fell in love with the people and place, and became the winemaker in 2005. Seven white wines are produced along with Pinot Noir from both Dunn Forest and BeckenRidge vineyards, a Pinot Noir Rosé as well as a Marechal Foch hybrid red wine. The style of wine is similar to Amity Vineyards of the past, with low alcohol levels, high acidity, and welcome food affinities. The wines are very reasonably priced considering the quality and I highly recommend you try them as well as make the effort to visit the winery. The tasting room is open Thursday through Monday from 12:00 p.m. to 5:00 p.m. March through November, or by appointment. 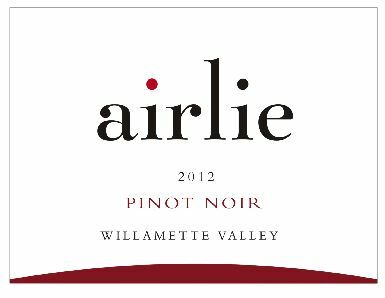 Visit www.airliewinery.com.